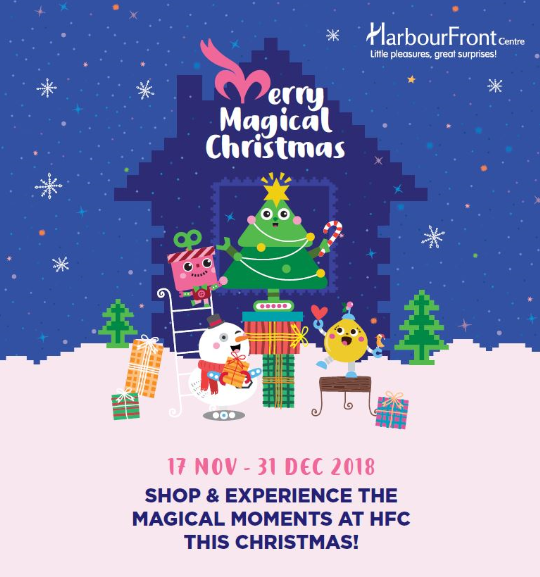 Merry Magical Christmas At Harbourfront Centre! Immerse yourself in the magical moments from The Ultimate VR Gaming Experience and Lego Robotics Workshop at HarbourFront Centre. Spend $180^ or $350* and sign up for our Lego® Robotics workshop at Level 1 Customer Service Counter. Brainstorm, build and experiment with the kids in this 1-hour workshop (worth $40), and bring the robots to life this Christmas! #Max. of 3 same-day receipts. Max. of 2 redemptions per shopper per day. Limited slots, subject to availability. LEGO® is a trademark® of the LEGO Group companies which does not sponsor, authorize or endorse this workshop. Spend $50# or more and get competitive in either of our 2 categories of the VR Game Challenge to win $4,600 worth of shopping vouchers! The average score of three gameplays in each round will be taken. Top 10 with the highest average scores in each category will be featured on the leader board and invited to participate at the Grand Finale on 23 Dec.
#Max. of 2 same-day receipts. Max. of 2 redemptions per shopper per day. Limited slots, subject to availability. Striving to score higher to stay at the top in our VR Game Challenge? Come and practise for FREE* on weekdays! *Limited to 1 free trial per shopper, subject to availability. Snap and stand to be one of the 5 winners to walk away $50 Mapletree Vouchers each with your creativity. Step 2: Snap a photo or record a short video of you and /or your friends playing the VR Games in HFC. Scan with your mobile devices to get 1-FOR-1 and more attractive deals this Christmas! Spend $50 and stand to win a Princess Cruises Holiday! Friends of HarbourFront Centre will receive 2x lucky draw chances! Spend & Feel the Magic This Christmas! Redeem a Limited Edition Reversible Wrapping Paper, Exclusive Silicon Kitchen Mitten and Towel Set worth $29.90 or take part in the Ball Pit Lucky Dip to win prizes worth over $15,000. Have a go at the Ball Pit Lucky dip and stand to win over $15,000 worth of prizes. *Max. of 2 same-day receipts. Max. of 1 redemption per shopper. Limited slots, subject to availability. Click here for the “Lego® Robotics Workshop” Terms and Conditions. Click here for the “VR Game Challenge” Terms and Conditions. Click here for the “Social Media Contest” Terms and Conditions. Click here for the “Lucky Draw” Terms and Conditions. Click here for the “Premiums” Terms and Conditions. Click here for the "Ball Pit Lucky Dip" Terms and Conditions. Click here for other exciting offers that are valid from 17 Nov till 31 Dec 2018.